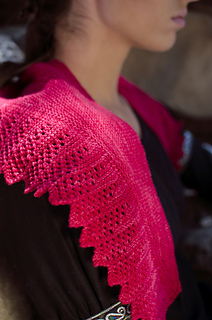 The crescent shape of the shawl is created by using German short rows and garter stitch. Then, the lace border is worked using the knitted-on border technique. 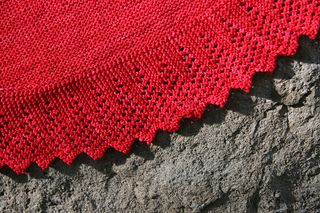 When blocked, the shawl measures 37” (94 cm) long and 9” (23 cm) at widest section. The shape makes it wearable both as a narrow shawl as well as a scarf. The sample was knit all in one color; however, the body and border can be knit as two different colors. If you want to work the shawl with two colors, you’ll need 425 yds for the body and 425 yds for the border. Thank you to my test knitters, megknitsalot and dambird, who provided valuable feedback.